Please read carefully the text below, before trying V9. V9 will not find your usb interfaces installed with the existing usb drivers "2017_07". Caution: once your interfaces are declared with the new usb drivers "2018_...", V8 will not find them. 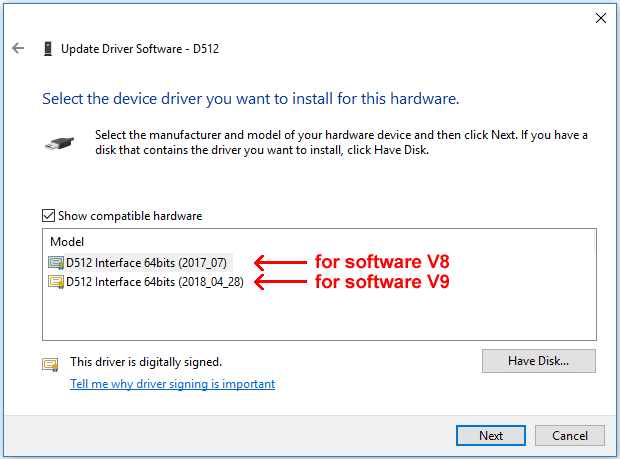 To allow V8 to find again your usb interfaces, you have to select the driver "2017_07" back in the Operating System driver properties window. If you are not friendly with the Operating System usb drivers process, or if the above explanations are not clear for you, please do not make any driver change on your working computer, and try V9 on a spare computer. Please note that the software install process will not make any change in your existing usb drivers. This means you can install and run V9, without changing anything between V8 and the usb interfaces. But V9 will not see your usb interface, as long as you keep the old usb drivers in your system. V9 finds it even with the driver « 2017 », but we do not guarantee it will work good, so please update also its driver to version « 2018 ». Unlike the other interfaces, V8 is able to use this interface with the driver « 2018 ». Windows: V9 is not able to drive the dmx interfaces with Windows XP and Windows Vista. However the software works (without interfaces) on these two OS. MacOS: there is no 32bits V9 software for MacOS. But V8 may not read V9 lightshows. This is why we eagerly encourage you to make a backup of your lightshows and stored them in a safe place (not in the software lightshow folder). If all above is clear for you, you are welcome to download and try V9 beta and leave your feedback in the forum. New full software setup published today (beta5). - the following important bug has been fixed: the Generator scenes generated with the "Lightshow Creator" are corrupted. If you edit the scene, select an empty channel and active it, then the software crashes. So please erase any existing generated lightshow with "Lightshow Creator" using the function "Lightshow Creator purge". And redo it with this new software version. - the "Virtual DJ" Pad command to trigger buttons does not need anymore the text "while pressed". Please download again the pdf file "V9_news.pdf", which has been updated. The file "V9_news.pdf" has been updated today with the new function: "Live - slider 'shift'". Please re-download it again, and have a look at this new function. The file "V9_news.pdf" has been updated. Live - navigate in drop down list gadget with the roller of the mouse. Steps - allow to put the mouse cursor anywhere in the Step duration entry box.